The United State (USA) 2018 kits for Dream League Soccer 2018, and the package includes complete with home kits, away and third. All Goalkeeper kits are also included. This kits alos can use in First Touch Soccer 2015 (FTS15). 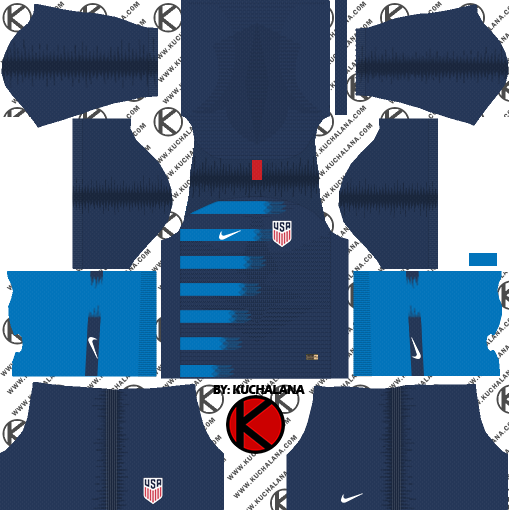 The United States shirts have interesting designs that complement each other. The place has a white base and adds horizontal stripes that change from red to blue and disappear as they reach the right. A detail of eagle and stars with the motto of the team (One Nation. One Team.) Appears inside the neck. The visit is navy blue, and gives continuity to the design of the place with blue stripes. For this changes the internal design of the neck, presenting the founding year of the federation combined with the motto, stars and "USA" within a circle inspired by NASA's space mission patches. Shorts and stockings in white for the titular uniform, combination of marine and blue for the one of visit. 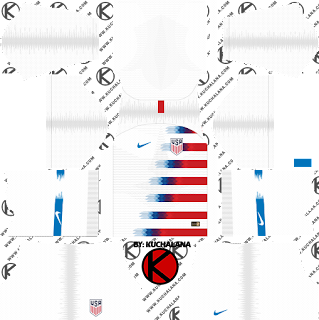 2 Komen untuk "The United State USA 2018 - Dream League Soccer Kits"